Right now 12/22 and 12/23, Menards has an On-Line 1/2 price sale $40 (Free Shipping) on what appears to be the perfect bath faucet replacement on an older PC. It is a brushed nickel finish Water Ridge faucet. It appears to have a nice swiveling spicket which is great. You'll need confirmation from Menards that it pivots. It has 4" centers which is what the PC utilizes. It seems very similar to the faucet we installed a few years ago, but another brand. 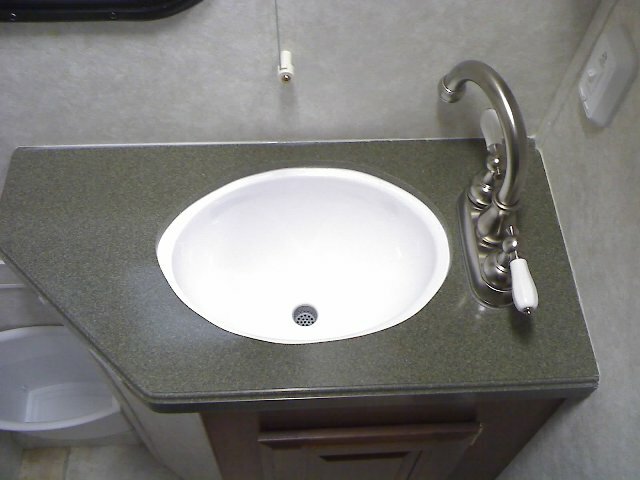 It is shown with the spicket swivelled out of the way to utilize the sink better.